Retired NASA astronaut Rick Searfoss, who piloted the space shuttle three times and later flew rocket planes for XCOR Aerospace, has passed away. He was 62. Searfoss, who retired from the U.S. Air Force as a colonel, died at his home in Bear Valley Springs, Calif., on Saturday, Sept. 29, according to the Tehachapi News. A viewing will be held on Friday, Oct. 12 at 12:30 p.m., at The Church of Jesus Christ of Latter-day Saints, 600 Anita Drive, Tehachapi, CA. Funeral services will follow at 2 p.m. For condolences, please visit www.woodmortuary.net. Born on June 5, 1956 in Michigan, Searfoss grew up in New Hampshire. In 1980, he graduated from Undergraduate Pilot Training at Williams Air Force Base in Arizona. He flew F-111 jets and eventually became a flight instructor and weapons officer. In 1988, Searfoss attended the U.S. Naval Test Pilot School, Patuxent River, Maryland, as a USAF exchange officer. He then became a flight instructor at the U.S. Air Force Test Pilot School at Edwards AFB. Searfoss logged more than 5,000 hours of flying time in 56 different types of aircraft during his career. Searfoss was selected by NASA as an astronaut in January 1990. 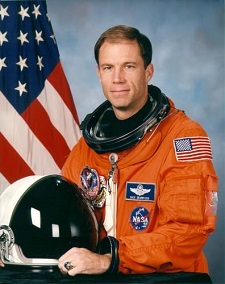 Logging more than 39 days in space, he served as pilot on STS-58 aboard the space shuttle Columbia. During the 14-day flight that launched in October 1993, the seven-member crew performed a variety of life-science experiments. Searfoss flew again as pilot in March 1996 aboard the space shuttle Atlantis. During the nine-day STS-76 mission, Atlantis made the third docking with the Russian space station Mir. Searfoss’ commanded the 16-day STS-90 mission, which launched in April 1998. The space shuttle Columbia carried the Spacelab module in its cargo bay. The seven-member crew completed numerous experiments and 256 orbits of the Earth before landing back at the Kennedy Space Center on May 3. Searfoss retired from the Air Force and NASA following the flight. He later served as chief test pilot for XCOR Aerospace in Mojave, Calif. Searfoss flew the company’s X-Racer rocket aircraft and had been planning to fly the Lynx suborbital vehicle before XCOR went bankrupt.